Cisco Systems, in 2009, released the following numbers for the origins of spam by country in descending order: Brazil at 7.7%; USA at 6.6%; India at 3.6%; South Korea at 3.1%; Turkey at 2.6%; Vietnam at 2.5%; China at 2.4%; Poland at 2.4%; Russia at 2.3%; Argentina at 1.5%. Surprisingly, you have to go all the way down to number 91 on the list before you get to Nigeria. 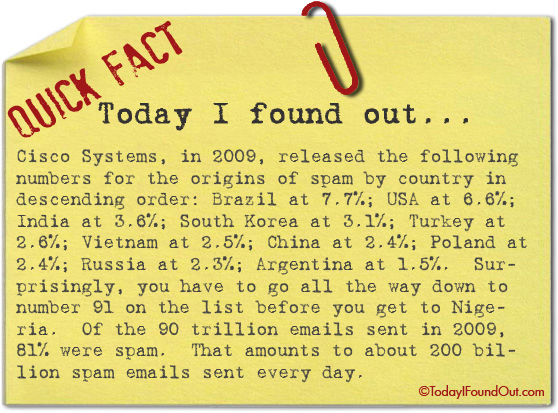 Of the 90 trillion emails sent in 2009, 81% were spam. That amounts to about 200 billion spam emails sent every day.